Here’s the problem: You get an email. Attached is a file that’s supposed to be a document. You want to print it on paper. But it’s a JPG or a TIF or a BMP, a photo of the document (we’ll just call it JPG). You open it, it’s looks OK. You try to print, and encounter calamity. Printing a JPG photo image onto paper is complicated. It’s not the same as printing a Word document or a PDF. 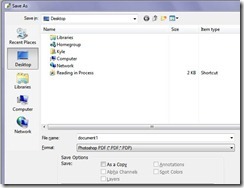 Word and PDF have standard printer settings. 8.5×11 inch, plain paper. You hit print, it prints. Easy. With a JPG, you have to program the settings first. It needs to know – How big you want the photo to be on the paper? Portrait or landscape? Color or not? Glossy or plain paper? And so forth. So scanning a document and saving it as a JPG for someone else to use is not a good idea. And it’s too bad that most scanner software assumes you are scanning photos, not documents, so a photo is what you get back by default. There are 2 easy ways for the sender to prevent this. I scan the photo with Photoshop, click File > Save As… and change JPG option to Photoshop PDF. What comes out is a PDF document, which anybody can print. If you use a scanner software that does not have the option to save as PDF, all you need is a PDF maker. They’re free. My favorite is bullzip. You download it, install it, and it acts just like a printer connected to your computer. 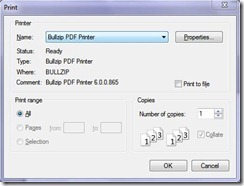 After you scan the document, you Print it, but change the printer from your paper printer to Bullzip, and a PDF is created in seconds. If you are the recipient of the JPG “document,” believe it or not you do the same thing. If you have Photoshop, open the JPG with that program, click File > Save As … and save it as a PDF. Or install a free PDF maker and you can make PDF files with whatever program you prefer to use to view photos on your PC. Why does Photoshop make PDFs? Because Photoshop is made by Adobe, which makes Acrobat, which makes PDFs. How do you scan a photo or a document with Photoshop? Place the image or document on your scanner – usually face down. In Photoshop, select File > Import. A list will appear. Follow the instructions on the screen – they are different for every scanner. This entry was posted in Geek, Tech Tips by Kyle Kimberlin. Bookmark the permalink. Right you are, Pete. PDF is not for photos, just documents – text on a plain background. TPS Reports, contracts, offers to sell widgets and redrunks. But with photos, one does well to remember that jpg is a compression format. If you've been working with layers and such, and you've got a jpg now, you've already lost a lot. Best I think to keep it in PSD format and use the web to send it. A nice site like http://min.us/ or https://www.yousendit.com/ will do greatness. I hate getting huge files by email, because I want to save the email's text but I don't want to keep the attachment in the email. That goes somewhere else. while i agree with you that it's good to have a standard for printing that everyone can share, that only works if the only intended use of the image emailed is to be printed. the problem with converting a JPG to a PDF format is that your converter automatically reduces the image resolution. it also turns it in to a print-output file (because that's what a PDF is) which by nature is only that – lost is all layer, camera generated meta data, and the ability to alter or edit the image. if we're talking a PDF for say, a Word file, i think you're spot on. but for images, i definitely prefer the file in whatever native format it was taken in. if i need to print it i can always set up my print parameters in Photoshop, or whatever image editing software i'm using.